Reporting to Britain’s senior official in the Persian Gulf Historically used by the British to refer to the sea area between the Arabian Peninsula and Iran. Often referred to as The Gulf or the Arabian Gulf. at Bushire, the Political Agent A mid-ranking political representative (equivalent to a Consul) from the diplomatic corps of the Government of India or one of its subordinate provincial governments, in charge of a Political Agency. at Bahrain helped formulate policies that affected not only Bahrain, but the wider Gulf. Initially housed in a structure built in 1901–02 on the eastern shore of Manama, the Bahrain Agency An office of the British Government and, earlier, of the East India Company. was altered and enlarged until 1955 when it was replaced by a modern concrete structure indicative both of Britain’s status in Bahrain, and Bahrain’s new-found oil wealth. Extract of a translation of a General Treaty signed with the Shaikh of Bahrain in 1820, in the wake of the British Resident's first visit to Bahrain the previous year. IOR/R/15/21, ff 21-26. Britain had first expressed an interest in Bahrain in 1613, when Thomas Aldworth, the East India Company’s chief factor at Surat, suggested locations for the establishment of factories in the Gulf to facilitate trade with Persia. In the eighteenth century occasional proposals to establish representation there, due to the importance of the islands as a trading post and pre-eminent centre of the pearling industry, all came to nothing. In the nineteenth century successive treaties defined the relationship between the British and Bahrain. The first official visit by William Bruce, Resident at Bushire, in 1819 was followed by the employment of a Native Agent Non-British agents affiliated with the British Government. at Bahrain from the 1820s onwards. In 1861, after Bahrain became a British protectorate it gradually became clear to the Government of India that it would be advantageous to appoint a European officer in Bahrain, especially as a means of encouraging trade. In addition to the perpetual Persian claims over the islands, the British were increasingly concerned about Ottoman and French activities in the area. The proposal to station a representative in Bahrain was strongly supported by the Political Resident A senior ranking political representative (equivalent to a Consul General) from the diplomatic corps of the Government of India or one of its subordinate provincial governments, in charge of a Political Residency. at Bushire both on political and commercial grounds. In 1899, the Viceroy Lord Curzon recommended the appointment of an Agent at Bahrain as a necessary part of the expansion of British influence in the Gulf. Letter from the Deputy Secretary to the Government of India to the Political Resident in the Persian Gulf, 4 July 1899. IOR/R/15/1/330, f 7. Far from any sudden shift in focus, the Agency An office of the British Government and, earlier, of the East India Company. gradually transitioned from Native to Political Agency An office of the British Government and, earlier, of the East India Company. . In January 1900, the first British officer John Calcott Gaskin took up office and, in 1904, was replaced by Captain Francis Beville Prideaux, who was later granted the rank of Political Agent A mid-ranking political representative (equivalent to a Consul) from the diplomatic corps of the Government of India or one of its subordinate provincial governments, in charge of a Political Agency. .
Letter from John Calcott Gaskin to Captain Arthur Trevor, Political Resident, dated 24 September 1904, writing of the appointment of Captain Prideaux to the position of Political Agent in Bahrain. IOR/R/15/1/330, f 64. Internally, the Political Agency An office of the British Government and, earlier, of the East India Company. maintained separate English, Vernacular and Confidential Offices, staffed by a team of clerks and interpreters, many of them British Indian subjects, and backed up in turn by a largely Arab staff. The Confidential Office dealt with politically sensitive papers and was initially run single-handedly by the Agent himself. The Vernacular Office handled consular and judicial business and correspondence in Arabic and the English Office covered matters of general administration. The amount of administrative business handled by the Agency An office of the British Government and, earlier, of the East India Company. – which was always understaffed – increased greatly in the period between the two World Wars. There were several factors affecting this: the Arabian littoral air route, the presence of the British air base at Jufair (and after 1943 the RAF base at Muharraq), the rise of Bahrain as a commercial centre, the growing quantity of court work, and, particularly, the steady increase in oil company operations. With increased numbers of non-Muslim foreigners living in Bahrain as a result of the burgeoning oil industry, the work of the Agency An office of the British Government and, earlier, of the East India Company. courts increased exponentially. Architectural plans for the Agency building, c.1905. IOR/R/15/2/52, f 96. In 1924, an Assistant Political Agent A mid-ranking political representative (equivalent to a Consul) from the diplomatic corps of the Government of India or one of its subordinate provincial governments, in charge of a Political Agency. was appointed, whose role became even more important after 1933, when the Agency An office of the British Government and, earlier, of the East India Company. took on responsibility for Qatar and the Trucial Coast The historic term used by the British to refer to the Gulf coast of Trucial Oman, now called United Arab Emirates. . The key local relationship for the Agency An office of the British Government and, earlier, of the East India Company. was with the Sheikh of Bahrain, whose influential and long-serving Adviser, Sir Charles Belgrave, greatly expanded Bahrain State affairs and the amount of correspondence passing between the Agency An office of the British Government and, earlier, of the East India Company. and Bahrain’s Ruler. During the First World War, the Agency An office of the British Government and, earlier, of the East India Company. was removed from the authority of the Political Resident A senior ranking political representative (equivalent to a Consul General) from the diplomatic corps of the Government of India or one of its subordinate provincial governments, in charge of a Political Residency. at Bushire and placed under the direct control of Sir Percy Cox, Chief Political Officer in Mesopotamia, modern-day Iraq. During this time policy towards Bahrain was formed in the light of British interests in Mesopotamia. In addition, relations with Ibn Sa’ud were central to the work of the Agency An office of the British Government and, earlier, of the East India Company. , particularly following the treaty of Darin in December 1915, which established the lands under his control as a British protectorate. Meanwhile the Government of India’s interests were largely ignored. But by 1922, immediate control of Bahrain had been returned to the Political Resident A senior ranking political representative (equivalent to a Consul General) from the diplomatic corps of the Government of India or one of its subordinate provincial governments, in charge of a Political Residency. in the Persian Gulf Historically used by the British to refer to the sea area between the Arabian Peninsula and Iran. Often referred to as The Gulf or the Arabian Gulf. . This arrangement lasted until Indian Independence in 1947 whereupon control passed to the British Foreign Office. The Political Residency A diplomatic office of the British Government established in the provinces and regions considered part of, or under the influence of, British India. itself had transferred from Bushire to Bahrain in 1946. However, less than twenty-five years later in 1971, Bahrain became independent and the Political Agency An office of the British Government and, earlier, of the East India Company. was dissolved. All remaining official British representation was left in the hands of an ambassador and his staff, some of whom had previously been Native Agents. 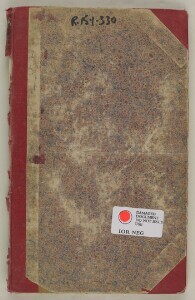 The archives of the Bahrain Political Agency An office of the British Government and, earlier, of the East India Company. (1899–1951) form part of the India Office The department of the British Government to which the Government of India reported between 1858 and 1947. The successor to the Court of Directors. Records. They comprise 2022 files listed under the reference IOR/R/15/2; a selection of this material has been catalogued in detail and forms part of this digital archive.